BioWare intends to get some serious mileage out of the Dragon Age: Origins franchise, with plans to support the game with DLC for at least the next two years. 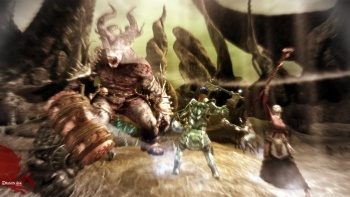 Dragon Age: Origins isn't going to be a game you just play, uninstall and forget. Not only is it a massive, epic RPG, BioWare is also taking steps to ensure that you'll keep it installed on your system even after you've saved the day and gone home with the prom queen. Executive Producer Mark Darrah told The Game Reviews that the company has plans for a wide range of Dragon Age DLC that it intends to release over the next two years. "We have plans that stretch out for basically two years. And it's going to be everything from really small stuff like item packs up to larger quests that might last an hour or two up to even fully fledged expansion packs," he said. "Really it's a broad, long term support plan for the game." The DLC is planned for all platforms, he said; while BioWare might eventually put out "something related to the toolset" which would naturally be PC only, "everything [else] is planned to be across all platforms." The studio is also exploring options for getting user-generated content out to console gamers. That sort of material has typically been reserved for PC gamers and while there are obviously some challenges in getting it to consoles, he said, "It would be something we would love to do."